As a boy growing up in the provincial town of Castel San Giovanni,close to Piacenza, in Italy, Stan Lee’s Spiderman classics and the fantasy art of Europe were fantasy beyond imagination and an inspiration for Guido’s lifelong pursuit of art. While traveling to London and Amsterdam in the late ’80s he discovered the raw power of tattoo art, its hope, its challenges and its life affirming character. Returning to Italy Guido studied law at Statal University in Milan for two years until he realized that his heart and future belonged to art. He left Italy and toured the US collecting tattoos on himself as well as drawing a new visionary tattoo art. The appreciation he received from tattooists bolstered his enthusiasm and confidence so back in Italy he worked in the graphic industry and began his first commercial foray doing murals, commercials and residential interior designs. Fulfilling his obligations to serve his country in the Army ,Guido had occasion to develop his own tattooing skills.When he finished his year in the Army he was ready to actively enter the world of tattoo as artist and practitioner. Back in his home town,in the fall of 1994, he opened his first shop, “Taos Tattoo” named after a small southwest city he visited and became intrigued by in his first US trip. The shop soon developed into “Primal Mind Productions” to better showcase the broad range of talent the shop attracted, in tattooing, fashion and piercing. His art was commissioned and published in tattoo flash magazines Tattoo Idea and Color Tattoo for 3ntini Publications. Looking for more inspiration and growth Guido returned to the US in 1999 and tattooed extensively first at Sacred Tattoo in New York City’s Chinatown, then at Bowery Tattoo in NYC. 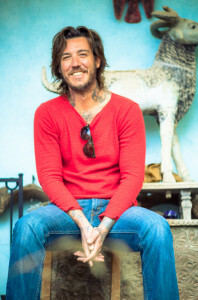 Then in 2004, yearning to rekindle his earlier experiences and curiosity for New Mexico Guido moved to Taos, New Mexico and joined up with Eric Anderson at Cool Hand Tattoo Studio and produced art and tattoo. After living and working in Taos for three years Guido would relocate to Santa Fe. Before eventually opening his own shop he had the great pleasure to work with two Santa Fe stalwart tattooers: Dawn Purnell at Dawn’s Custom Tattoo and Mark Vigil at Four Star Tattoo. In April 2013 Guido opened LOST COWBOY TATTOO AND GALLERY where he’s working with his friend and apprentice Owen Lostetter. The main goal of his first and only tattoo shop in the US is to provide a friendly and relaxing place for custom quality tattoos, all surrounded by a southwest atmosphere. Guido enjoys doing graphic work for his t-shirt line and collecting/creating odd artifacts to sell at the Gallery. Please inquire directly ,via e mail or phone if you are interested in Guido’s artwork or interior design as well (please check his portfolio).